The Midland WR-300 Weather Radio with Civil Emergency Monitor would make a great gift idea. You can get local weather reports when you need them most. It offers Digital PLL tuning for clear reception; S.A.M.E. localized reception; 30 programmable county codes so you can receive alerts about one county or many counties... from your home, to your vacation property and where your loved ones might be. This weather radio also acts as a full function alarm clock and has a built-in AM / FM radio. The Midland Weather Radio is powered by included AC wall adapter and 4 AA batteries (not included). 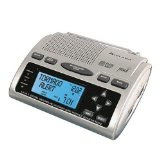 Midland WR-300 Weather Radio @ Amazon.com .